WELCOME! This gem has been in the Siragusa family since 1998 and it's our pride and joy. Come enjoy an extremely clean and family managed beach home. We strive to make our guests feel welcome and well taken care during their stay. Our 1600 square foot beach house is located on the 2nd floor at 112 46th Street which is centrally located to enjoy everything. Enjoy the sunset views from the front patio and soak up the sun on the back patio or Relax on the Beach that is only 50 feet away. The house is beach friendly with pergo flooring throughout the house and comfortable carpet in the bedrooms. 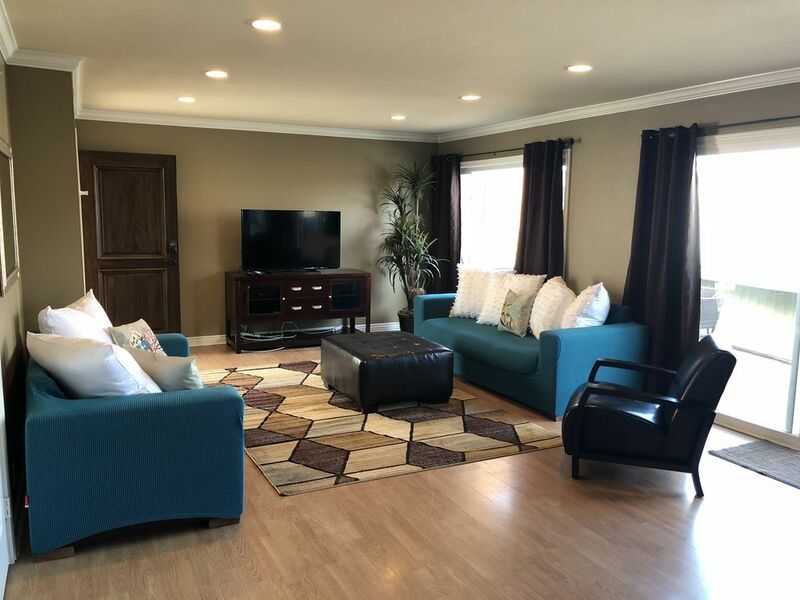 It's have 3 Bedroom/2 bath and we converted the 4th bedroom to a Bonus/Playroom stocked with toys, games, playstation, TV and DVD player with movies and a full size futon for extra guests. The back playroom is attached to our 2nd back patio with lounge chairs and tables. The house has been freshly painted and new carpet in the bedrooms April 2018. No smoking / No Pets / Max 8 persons. 2 Patios. 1 off the back bedroom / playroom and 1 out front to watch the sunsets and ocean view. House Amenities that are included in the price UNLESS the price is discounted. Linens, blankets, comforters, pillows, 4 towels sets to each bathroom, Kitchen Towels/New Sponge, 8 Beach Towels, Toilet Paper, Paper Towels, Kleenex, Laundry Detergent, Dish Soap, Dishwashing Detergent, hand soap, shower bar soap, Shampoo/Conditioner, lotions, hair dryer, bathroom amenities including but not limited to: First Aid, aspirin, cotton ball, qtips and much more. FRONT LIVING ROOM: Comfortable Sofa and love seat, HD Flat Screen TV with cable, Wireless Internet, DVD player with 30 DVD movies. Stereo/Ipod hookup with speakers, Low maintenance pergo flooring. High ceilings to give a light and airy feeling of living at the beach. KITCHEN: Open floor plan that opens to the dining room and living room. Kitchen was remodeled with tumbled tile countertops and efficient appliances. It is fully furnished to meet all your cooking and entertaining needs. Including but not limited to: Place settings for 8, Full set of Pots/Pan, a coffee maker with filters, blender, toaster, muffin tins and crock pot. BEDROOM 1: It is furnished with a Cal King Bedroom set, dresser, large wall closet, Alarm clock, Ironing Board/Iron and fan BEDROOM 2: The 2nd bedroom is furnished with comfortable queen beds and a dresser as well as beachy decor and a fan BEDROOM 3: The 3rd bedroom is furnished with 2 twin beds, a fan, extra blanket PLAYROOM/BEDROOM 4: This room was converted into a playroom with cable TV, DVD player and children DVD Movies, Playstation, Games, Toys, Beanbags and a Futon that sleeps 2 comfortably. OUTDOOR WASHER/DRYER LAUNDRY ROOM: Equipped with a washer and dryer and detergent. 2 LARGE PATIOS FRONT PATIO: has a beautiful view of the ocean and Catalina Island. It's roughly 50 sq ft with a 6 person patio set and umbrella, a propane BBQ and a 2 person table. BACK PATIO: has 4 airdac chairs, 2 tables and a tub full of beach toys PARKING: 2 car parking; 1 garage and 1 designated spot behind the house. BEACH TOYS: 4 boogie boards, 4 beach cruisers, beach toys, balls ,games, shovels, pails, beach chairs, beach umbrella and Beach towels MANAGEMENT: Very clean and professionally managed. You will be greeted at the house upon check in to be shown the house and the neighborhood. Available 24/7 for any questions, issues or concerns that come up during your stay. We had an enjoyable time at this house. It was very clean and comfortable. Brenda was very friendly and nice to work with. Home was stocked with nice little thinks we always forget like handsoap and laundry detergent ect.. The kids loved riding the bikes provided down to the peir. Thanks for the fun memories. Great place. Great loacation. Will book again in the future. We thoroughly enjoyed our stay! Great house and great location in Newport Beach! We spent a week here, and had a great time. The house was great and had pretty much everything we needed. It's in a great neighborhood and great location, just across the street from the beach entrance. Brenda (owner) was great to work with and we had all we needed. We had three little ones (ages 5, 6 & 8) and did several days at Disney, which wasn't that far of a drive (maybe 25 min?). The house was great for the kids, and had lots of toys and kid-friendly videos. The kitchen was well stocked, and we mostly did all our own meals at the house. Beds and pillows were pretty comfy, and it was great to have a king bed in the master bedroom. We ate some meals on the deck, from which there is a partial view of the ocean. We would stay here again! Fantastic location and lovely property manager, Brenda! The apartment was comfortable and in an awesome location. We have 4 young children and the play room with toys and movies was great! The property manager Brenda was kind, helpful, and gracious! She had a playpen, high chair, and umbrella stroller for our toddler ready for us upon our arrival! So convenient - thank you! This house was perfect for our group of 9 (5 kids including a 6 month old and 4 adults). The place was very clean and was just a few steps from the beach. It had everything we needed to have a great day at the beach. There were beach towels, beach chairs, coolers, boogie boards. It's nice not to have to pack this stuff and bring it along. We drove from Arizona and kept in touch with Brenda along the way. She met us at the house so there was no waiting. We would definitely stay here again. Primary occupant to complete and submit rental application and copy of valid driver's license for approval. Upon approval, Rental Agreement and Down Payment are required to hold the dates. The $500 Damage Deposit 40% down payment and the remaining payment is due 45 days prior to arrival. $2000 Damage Deposit Insurance required for stays longer than 14 nights and payment 90 days prior to arrival.